Please welcome Jessica Brockmole, author of Letters from Skye, as she tackles our Desert Island Interview! Jessica Brockmole grew up in the Midwest but began writing Letters from Skye while she was living in Edinburgh. After her second child was born, she and her husband escaped the city and spent a week on the Isle of Skye. The story came to her on the journey home and she started scribbling notes in the car. To begin with, the outpouring was less a novel than an extended letter to herself, written late at night when everyone else had gone to bed. A letter reminding her not to lose touch with the people she loved, and reassuring her that she would be stronger for overcoming her fears. Jessica now lives in Indiana with her husband and two children. Letters from Skye is her first novel. Something long that will take plenty of hours stretched on a beach to read, like War and Peace, The Complete Works of William Shakespeare or The Compact Oxford English Dictionary (no, really!). Bonus: the wee magnifying glass that comes with the OED can be used to start fires. A thick, fluffy duvet? I can’t see a blanket of woven palm leaves being quite as cozy. Duct tape! On an episode of the show Mythbusters, they showed what you could make if stranded on an island with nothing but a pallet of duct tape. They made shelter, hammocks, shoes, hats, water containers, nets, and even a raft. Whether or not I could replicate those things is another question, but at least I’ll have time to practice! I’m unabashedly an introvert, so I’d probably enjoy it longer than I’d care to admit. Unless this island came with thunderstorms. Then I might reconsider. It’s probably cliché to say “my husband,” but that’s my answer. He cooks, he builds things, and he looks great shirtless on a beach. Also, he comes in handy if those aforementioned thunderstorms hit! As long as he leaves me to read my dictionary when I want, I’ll share my duvet. My laptop. I start getting twitchy if I go too long without writing. On vacations (where I leave the laptop at home), I can always scratch the writing itch with a hotel pen and a stack of cocktail napkins. But, unless this island comes with a bar (please? ), I’m out of luck. Fresh coconuts and bananas are all well and good, but I know I’d start wishing for some cheese. I tried a dairy-free diet once. I lasted about two hours. If I had my husband, I’d be able to cope for many more days than if I didn’t. I’m restless without him. Take a long, hot, bubbly shower. 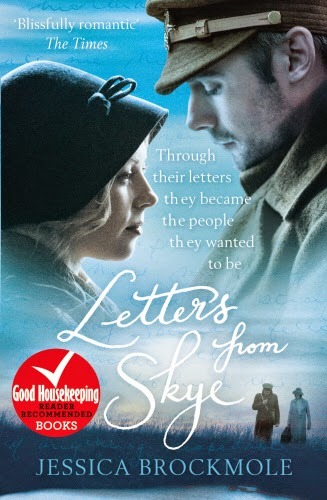 A sweeping love story told through letters, spanning two continents and two world wars…. Elspeth is fond of saying to her daughter that 'the first volume of my life is out of print'. But when a bomb hits an Edinburgh street and Margaret finds her mother crouched in the ruins of her bedroom pulling armfuls of yellowed letters onto her lap, the past Elspeth has kept so carefully locked away is out in the open. The next day, Elspeth disappears. Left alone with the letters, Margaret discovers a mother she never knew existed: a poet living on the Isle of Skye who in 1912 answered a fan letter from an impetuous young man in Illinois. Without having to worry about appearances or expectations, Elspeth and Davey confess their dreams and their worries, things they've never told another soul. Even without meeting, they know one another. Played out across oceans, in peacetime and wartime but most of all through paper and ink, Letters from Skye is about the transformative power of a letter - the letter that shouldn't have been sent, the letter that is never sent and the letter the reader will keep for ever..